This is the most extraordinary place we have ever stayed at. 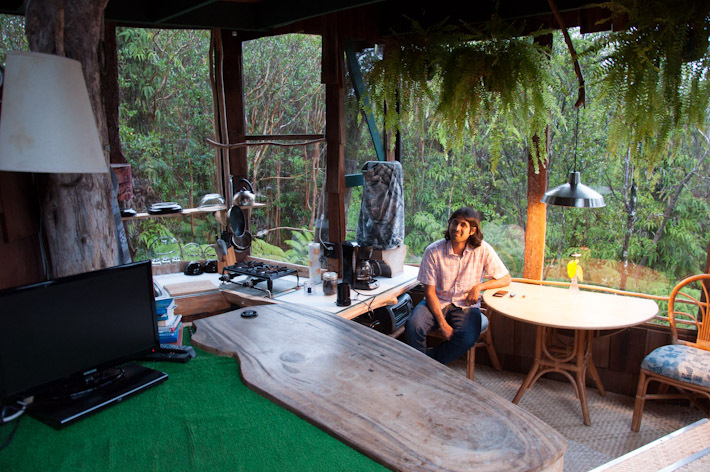 Skye, the artist behind this tree-house near Volcanoes National Park, in Hawaii, is the closest to a building genius I have ever come across. 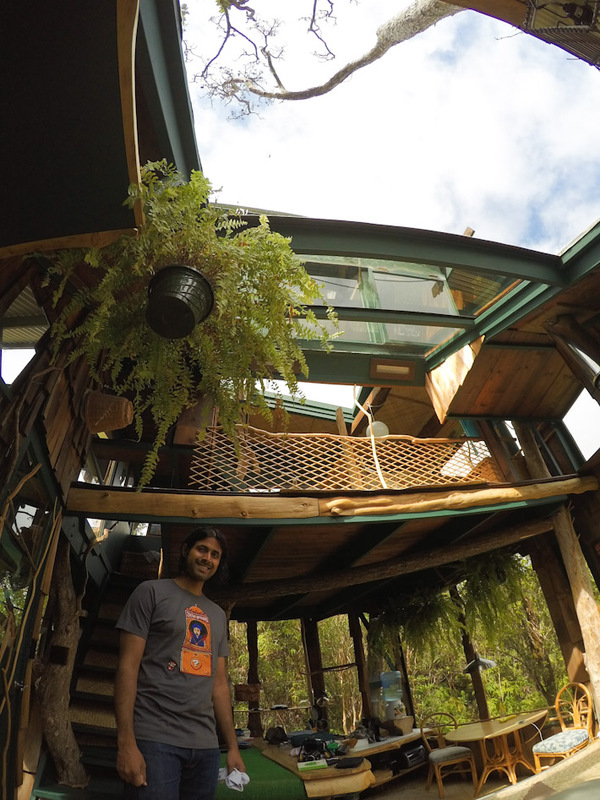 He managed to build this tree-house (which has a bigger sister in the neighborhood) without using invasive methods. This means that no trees had to be cut down in order to create this magical home (in fact, they keep on growing as you read this). The respect for nature and the immediate surroundings is obvious not only to the eye, but as Skye walks us in an explains that everything was done keeping sustainability in mind. All materials used for the construction are recycled. Power is 100% solar and water used in the shower and taps is collected rainwater which gets filter and treated. For drinking and cooking purposes, there is a big container with drinking water provided. 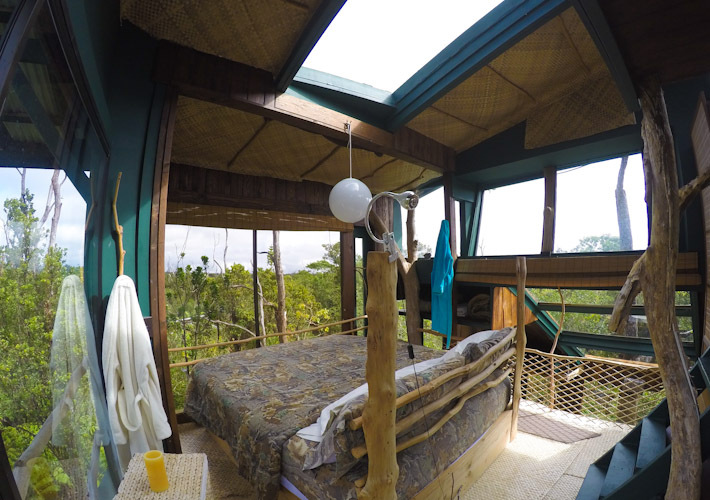 Not only the tree-house looks like something out of a story book, it also offers a lot of comforts of the modern world. Looking around I state “You could actually live here“, to what Skye replies “Of course, this was my home for several years!“. That explains a completely equipped kitchen (with fridge, plenty of pots and pans to cook with, stove, coffee machine and even a coffee grinder). 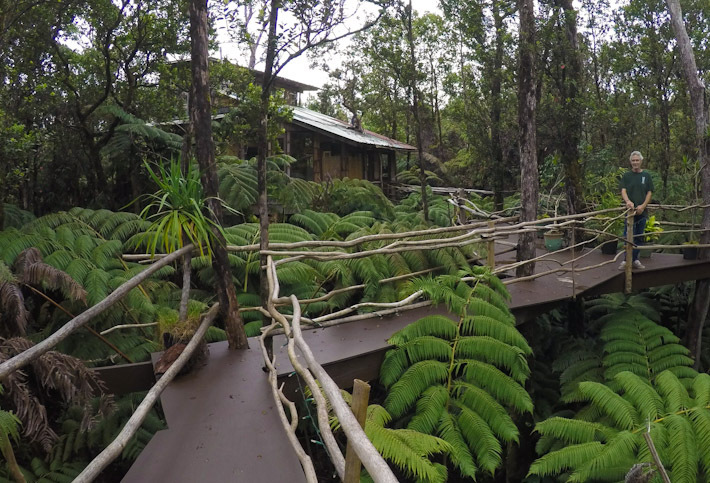 As well as the entertainment collection that includes CDs, DVDs (some about the nearby Volcanoes National Park), TV (to watch the DVDs), board games and even a small library. The living room has a comfy couch that invites you to stick around in the evenings. If it’s cold, there are fluffy blankets and a fire-place to warm up the spirits. Talk about a romantic atmosphere! 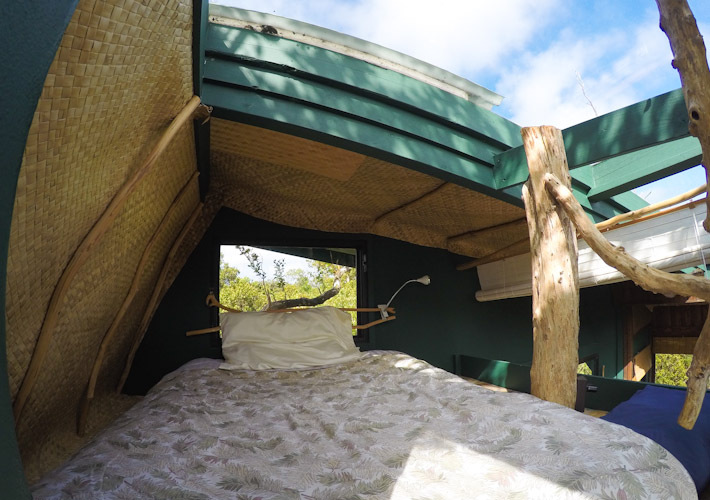 Watch DVDs inside a treehouse? Check! 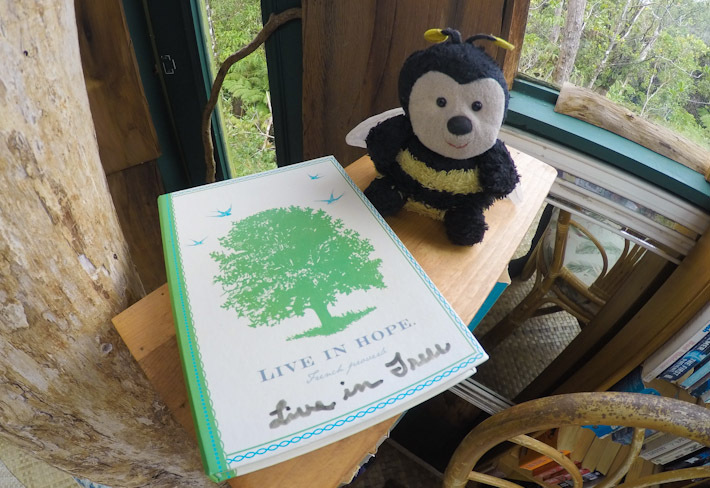 Live happy… live inside a treehouse! Upstairs, there’s plenty of room for a master bedroom and a secondary bed with enough space for a couple of kids or adults. There are nice comforters, robes and lots of storage space all around. The use of space is the house is truly incredible! Imagine the feeling of waking up in the middle of the night because the moon is shining too bright right above you. You close the shutters above to sleep well and, finally, wake up in the morning with a glorious blue sky and lush greenery all around you. 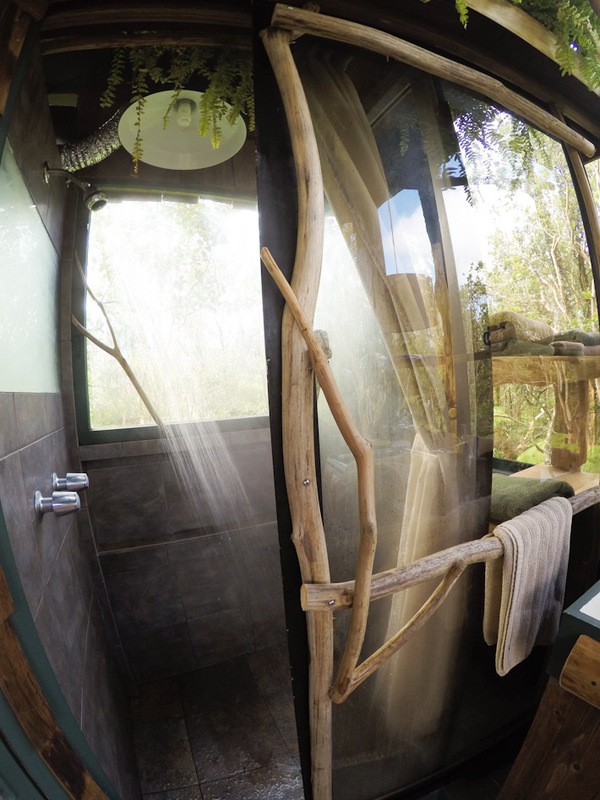 You must walk downstairs to use the bathroom… and what a bathroom that is! You are not very likely to do your deeds with a better view anywhere else in the world. 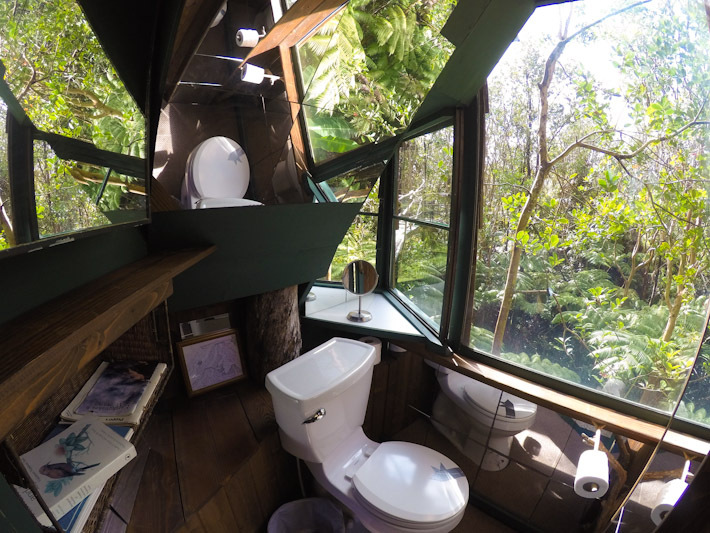 The most incredible view out of a bathroom ever – don't worry about privacy, there's only plants and birds around! The shower gets plenty of pressure and hot water. 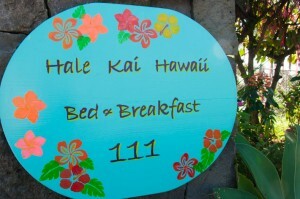 While good-quality towels and eco-friendly shower gel are provided. Over all, this feels like the happiest house on earth. Glass is used extensively for the walls and ceiling, allowing a lot of natural light to come in. 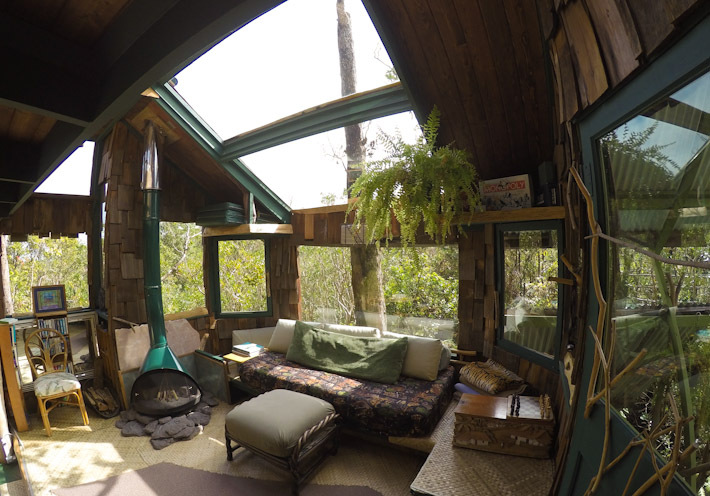 Between the rays of sun and the plants hanging inside the house itself, the frontier between indoors and outdoors is really thin. 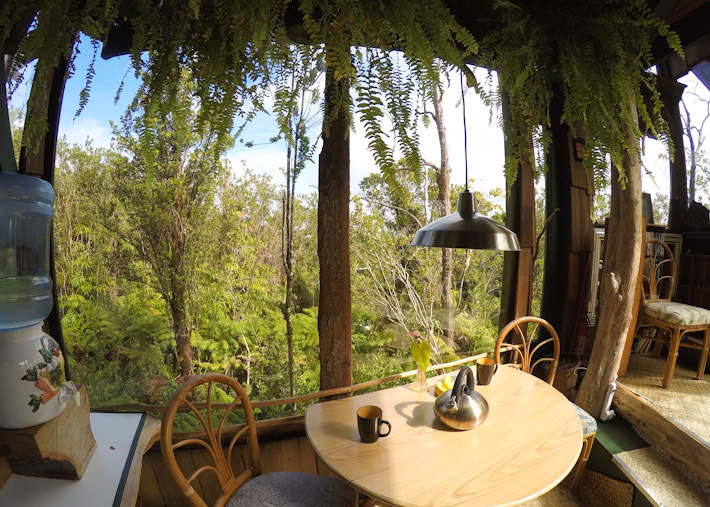 Outside, there’s a canopy for you to mingle with nature, and a sitting area for you to have your morning coffee and make friends with the birds. 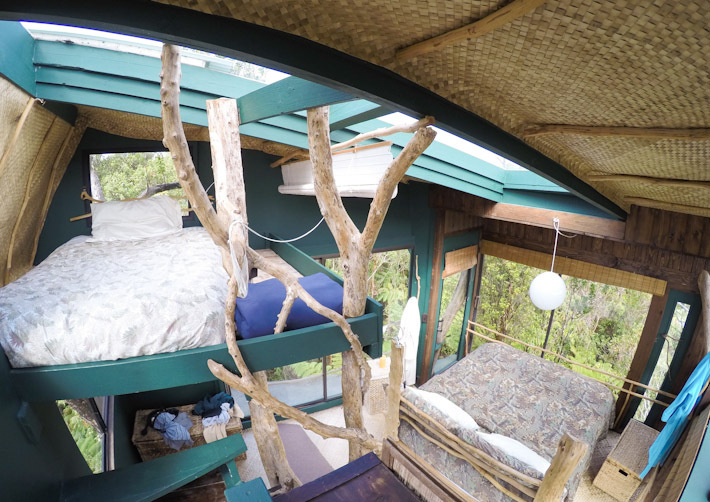 The tree-house can’t be seen from the road or the “outside world”. Once you are on the inside, it’s time to get lost in a magical world… Is almost like a well-kept secret that we want to share with you. 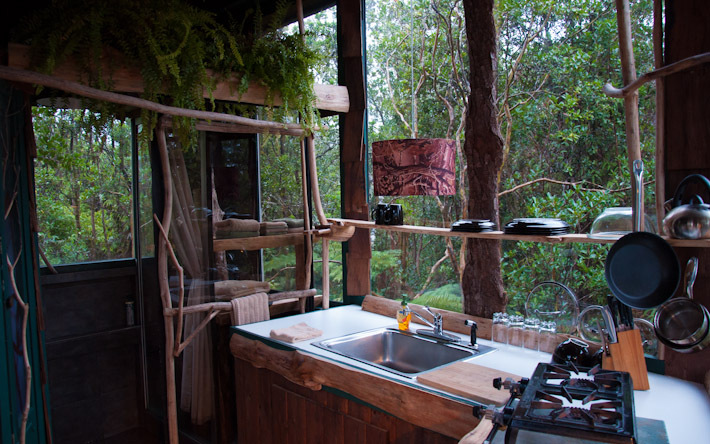 Skye’s tree-house not only respects the surroundings, it blends with them in a way I had never seen a house do before. You can feel that there’s so much love and care that have gone into building and maintaining this house. Skye built it all by himself during a period of 6 years. Now, it is a privilege for any of us that he has opened up the doors to this world of wonder! This looks beautiful! I’d love to stay here with Avi, I’m sure he’d love it too. I am however scared to stay near any place where there are a lot of tree due to creatures like snakes and scorpions, you never know when they’ll creep in. What’s your say about that? Would this place be prone to snakes? 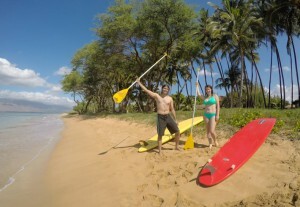 There are no snakes in Hawai’i! There are no snakes in Hawaii! There is a small scorpion as well as centipedes but these really like the lower warmer elevations by the water, at least here on the Big Island. I’ve never heard of either of them in Skye’s treehouses that are 20 feet or so off the ground! Both are one of a kind masterpieces to visit. There are no snakes or scorpions in the TreeHouse or even on the Island. We have some flies , moths and a few spiders which I don’t let stay inside. 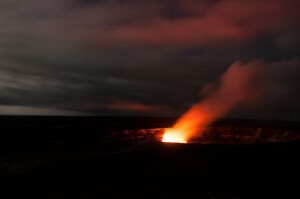 This area was flowing red lava just 350 years ago and it takes along time for bugs to walk the 25 miles up from Hilo. Plus it’s very tightly closed up. 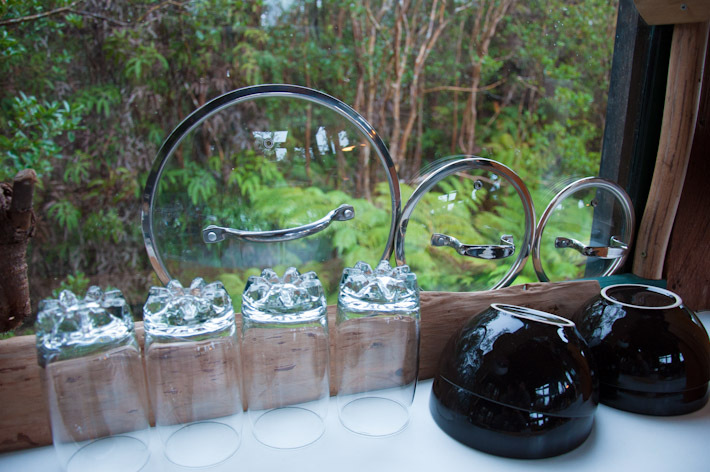 e-mail me if you like, at skye@volcanotreehouse.net. I could live there for a longer while too. I would get a mobile internet connection (the only thing “missing” is WIFI, really) and this would become an ideal spot to live and work from! Wow, what a beautiful place! I especially love the play of light and shadow inside! 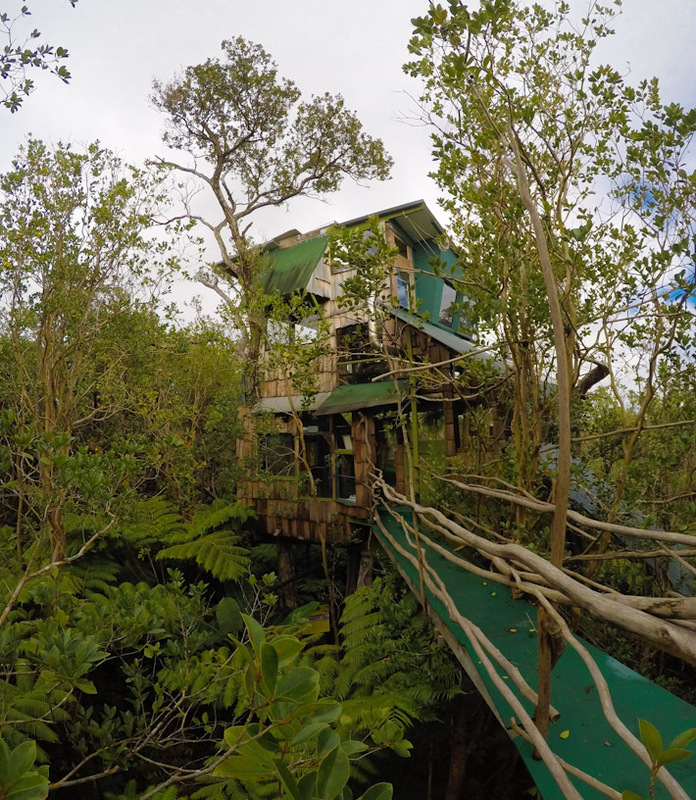 I loved your guys article about staying in an Eco-friendly treehouse near a Hawaiian volcano. That’s a real adventure right there! Keep up the good work! 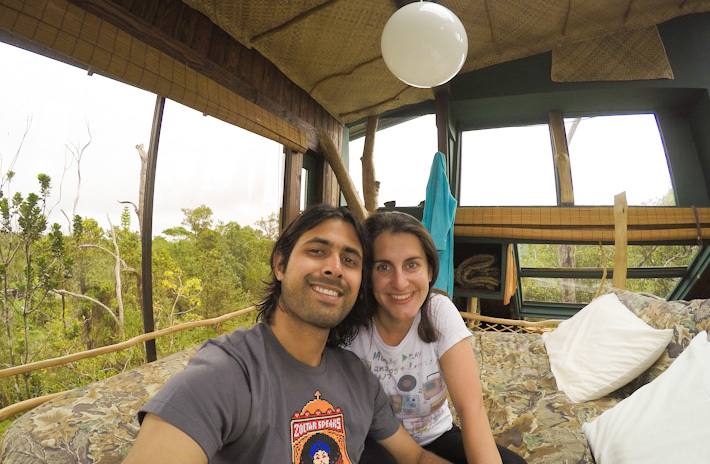 This tree-house was so nice, that we didn’t almost feel like going anywhere else around it in search of adventure! Wow, I want to try it too! Just like Zara, I think I wont leave the house anymore when I stay there. I’ll just savor every corner of it. Really cool! This is the type of place one falls in love with hard and never wants to leave! Yes, this is Skye’s place :) We just stayed there back in November. 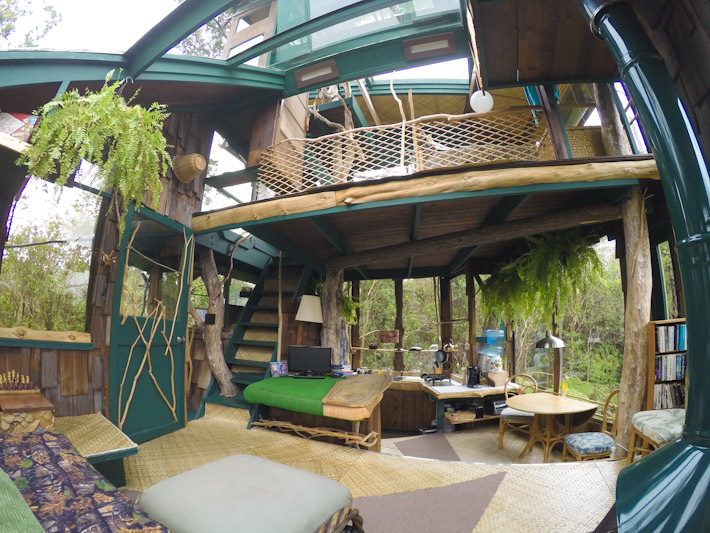 We stayed in his other treehouse though, but he showed us this one as well. Such an amazing place! And Skye is the man! I have to agree: Skye is awesome!! Can we move tomorrow and stay forever?? Love it, such a unique place with a magical atmosphere. 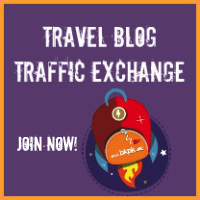 Thanks for sharing the experience! That sounds amazing ! I would love to stay there, it sounds like a unique experience !!! This is SO cool! I want to stay here!! Awesome photos!! 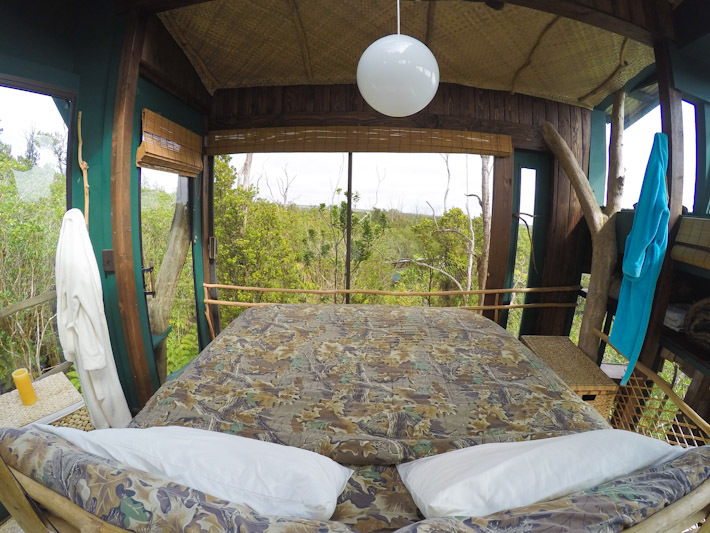 The smaller tree-house we stayed at costs $195 per night, for 2 people. I think what you guys are doing and did is admirable. What a great way to Live!